Is Flash CS5.5 a minor update or a must-have? Over time, we've gotten used to Adobe's Creative Suite release cycle of roughly 18 months or so for every major version of its software packages: Design, Web, and Production Premium, and Master Collection. And now comes Creative Suite 5.5. Are Adobe's new Flash releases just minor updates that we can ignore, or is the new version of the Flash family a must-have tool? Here's the scoop on why this Flash update is particularly compelling for rich Internet application developers. Flash started out as a simple vector-based animation tool for the Web. After Adobe acquired Flash via its buyout of Macromedia, it gradually developed the app into a full-fledged tool for creating rich Internet applications (RIAs). There was only one problem: Flash was not a great development tool for programmers or interface designers. Adobe addressed this problem by developing Flash Builder and Flash Catalyst. 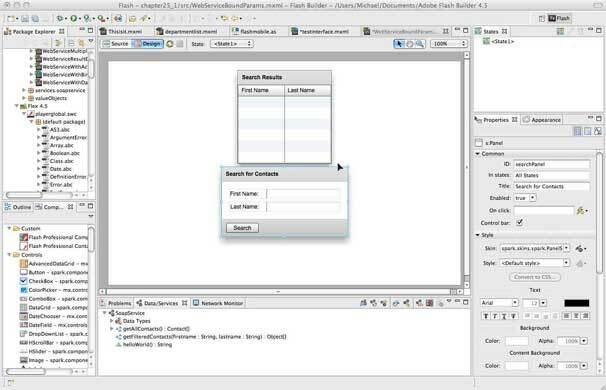 Flash Builder is an Integrated Development Environment (IDE) based on the popular Eclipse IDE, while Catalyst is specifically designed as an easy-to-use tool for non-programmers to create interfaces. What's new in Flash Catalyst CS5.5? The idea behind Catalyst—which debuted with Adobe CS5—is that designers can create an interface for an interactive application in Photoshop or Illustrator. This interface then would be imported directly into Catalyst as a starting point. Without having to know Flash, the designer can quickly create the required interactivity for buttons and page transitions. The process is so intuitive and easy to learn that a designer can have a working demo of the interface in a fraction of the time it would take to build the same prototype in Flash. The beauty of Catalyst though is the way it integrates with Flash and Flash Builder. You can, of course, bring in Flash files (swfs) and other elements before you export your Catalyst interface to Flash Builder. Now you can bring back projects from Flash Builder, which is the most important change in this new version. 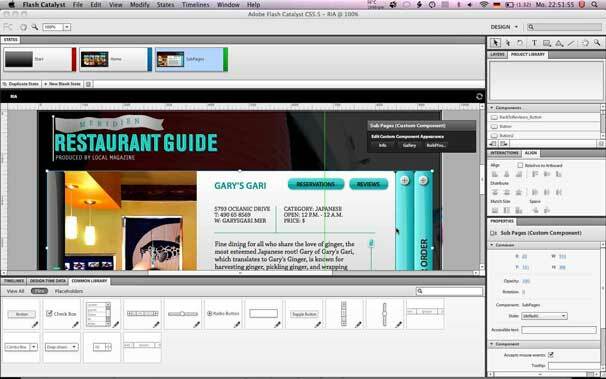 Flash Catalyst 5.5 offers wireframing to quickly create an interface. One of the most important new features in Catalyst CS5.5 is that you can actually have a different workflow. You rarely start out with a complete interface, where every detail has been worked out; most projects evolve gradually, and the new workflow in CS5.5 allows for that. As an interface designer, you can now create the interface and the interactivity by using wireframe elements. These are then imported into Flash Builder 4.5, where a programmer replaces them with custom components and adds in the business logic and data services. The result is a fully working application that you bring back into Catalyst to finish the design. What's new in Flash Builder 4.5? Apple CEO Steve Jobs publicly decided to exclude Flash from the iOS operating system and has promoted HTML 5 as an alternative. Adobe, in response, developed Wallaby, a tool to convert Flash projects to HTML 5. But it also included new tooling and framework support for developing, testing, and deploying mobile applications on Android, BlackBerry Tablet OS, and iOS. Imagine being able to reuse code from your Web application and release it on all major mobile devices. From a developer and publisher standpoint, this is awesome. If you work with PHP, you can even get a special edition of Flash Builder 4.5 for PHP, which integrates Zend Studio 8. Zend Studio 8 is a special plug-in for Eclipse, and this particular special edition offers a much tighter integration between Zend Studio and Flash Builder. Key features focus on the way data services are integrated and Flex/PHP debugging. If you don't need these, you can still import the Flash Builder plug-in into the Eclipse IDE to have one environment for all your coding. Only the method has changed. The other key improvement in Flash Builder is the aforementioned new workflow with Catalyst. You can code some features in Flash Builder 4.5 and return the file to Catalyst CS5.5 to enhance the design. For many users, this new two-way street will be a must-have feature. It is now possible to start the development of a rich internet application in Flash Builder 4.5, bring it into Catalyst to enhance the design, and bring it back into Builder. What's new in Flash Professional CS5.5? If you are a Flash developer, the main new feature in CS5.5 is the ability to develop for mobile devices (Android and iOS). You can even deliver content to internet-enabled televisions through Adobe AIR for the Digital Home. The concept of developing once and deploying to several devices works smoothly in this new version. One important factor is, for example, the various device screen resolutions. Adobe addresses this by simplifying the creation and management of multiple FLA files created for a single project, but targeted to multiple devices. It does this by updating modified symbols across other documents. Another issue is content scaling when resizing the stage. Without this feature, designers would spend a lot of time adjusting a single design for multiple sizes. Now you just check the "Scale content with stage" option in the document settings and you get a good starting point, especially since the scaling also applies to symbols and motion paths across all scenes. Flash CS5.5 and Flash Builder 4.5 both can create AIR applications for iOS and Android devices. Flash Professional CS5.5 also offers additional code snippets for mobile development like the Pinch to Zoom Event or the Two Finger Tap Event. You don't need the code snippet panel to use these features; it just provides a shortcut when developing. Another feature related to mobile development is that symbols can be rasterized on export, which improves the performance on some mobile devices. The symbols however remain editable, which is critical. There is one more thing, and it is not related to mobile development: Adobe has added the ability to lock or pin bones to the stage. The bone tool allows you to quickly animate a cartoon character, and with the enhanced features in the new version, it is now easier to place restrictions on the movements of selected bones. This, in turn, makes it easier to create more complex movements such as walk cycles. If you've never worked with the bone tool before, give it a try. If programming multimedia for the Web and Web applications is your main job, updating to Flash CS5.5 is a compelling prospect. There are many improvements that make this a significant update. For users who are happy with an older Flash version and don't create Web applications, CS5.5 probably doesn't offer significant new features. Note: With the release of Lion, Adobe posted a tech note outlining some of the issues users may encounter with some of its Creative Suite applications. The Flash family of products is discussed in some detail in this document. Be sure to check the tech note on Adobe's website for updated information on how Adobe Creative Suite products interact with Lion. Built around the powerful Flex coding tools. Spark skinning tools (for design). Friendly design tools for formatting data collection and presentation elements. Integrates smoothly with Flash Catalyst. Software is for coding experts only. No export to mobile devices. Powerful testing and coding features are available only in the Premium edition (which does not ship with CS5).